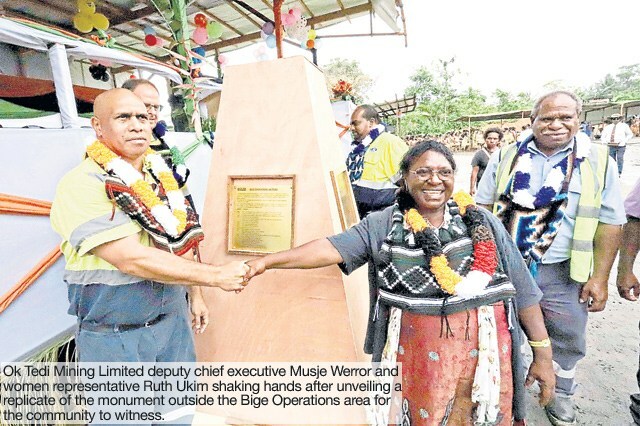 The Lower Ok Tedi dredging project in Papua New Guinea celebrated 20 years of operations at Bige in North Fly, Western, recently. The project which began on March 30, 1998, was a joint partnership between Ok Tedi Mining Limited and its partners Lower Ok Tedi Investment Limited, Lotic Bige Limited and Dredeco. 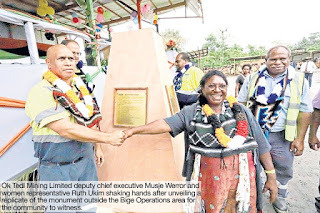 A monument was unveiled by OTML deputy chief executive Musje Werror at the Bige operation site. Werror thanked the people for allowing OTML to start the dredging and rehabilitation project 20 years ago. “Without that consent, Ok Tedi will not be here. Without that consent the Bige operation will not be here,” he said. “We must commend the leaders of that time who saw that something had to change to sustain the livelihood of the people. It was through their wisdom that we are now celebrating. “We have received a very high level of maturity. We came through hardships. Now we are looking forward to tomorrow. “The reason why the Bige operation continues to operate without any problems, without any issues is because of the partnership we have with our communities, Ok Tedi, our employees, women’s groups, business groups – all joining hands to make a difference. Dredeco general manager Erwin Deseranno thanked the employees for their loyalty and dedication.